This tutorial shows you how to use the NI circuits teaching solution, which features NI Multisim and NI ELVIS to teach students about active analog filters. It focuses on an active RC highpass filter. With these instructions, students should be able to compare the results of a simulated and prototyped active RC filter in the same environment, Multisim. Traditionally, circuit theory is taught using three different tools: textbooks and lecture, software simulation, and breadboarding and testing in the laboratory. With no correlation between the tools, students often struggle to transition from the classroom to the lab, and from theory to implementation. This 'siloing' or 'isolating' of each phase in the learning process today inhibits students from gaining the experience they needs to be successful engineers and scientists of tomorrow. The NI circuits teaching solution is the complete platform of software, hardware, and courseware for educators to build student expertise through practical hands-on experimentation with electrical circuits. The solution connects theory directly to real components in simulation and integrates physical analysis immediately in experimentation. 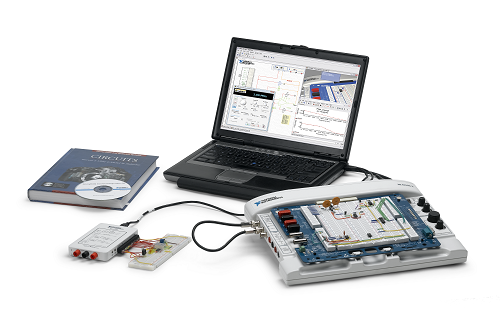 The NI circuits teaching solution includes the NI Multisim circuit teaching software which enables learning through an intuitive, pedagogical user environment to define circuit diagrams wich simulation powered by industry-standard SPICE technology. The other component of the solution is the NI ELVIS modular engineering education laboratory platform which combines a rugged, laboratory optimized form factor with 12 measurements instruments powered by industry-standard LabVIEW technology. Students are able to gain a strong circuit theory foundation using pedagogical tools developed for academia, but based on the same technology they will use in their engineering careers. Note: Skip ahead to Step 3 if you want to build the circuit first. Also, ensure that your NI ELVIS II device is connected to your computer and detected before launching Multisim if you want to compare simulated data to real data in the same sitting. Multisim checks for all connected NI devices at launch time. You have to close and reopen Multisim to detect newly connected devices. 1. Launch Multisim by navigating to Start»All Programs»National Instruments»Circuit Design Suite»Multisim. 2. Create a new NI ELVIS II or NI myDAQ design (this example uses an NI ELVIS II design) by navigating to File»New»NI ELVIS II Design. 3. Observe the schematic. The NI ELVIS II device features connectors for all terminals, so you can fully simulate the hardware instrumentation within the virtual environment. 4. Place the desired operational amplifier for the filter (this example uses a 324) by right-clicking Place component. Click OK to select the component and return to the schematic to place the component. 5. Left-click to place the LM324 operational amplifier on the schematic. Choose A from the pop-up window to select a Type A amplifier. 6. When the Select a Component dialog box reappears, you place the next component. Next, place the 220 nF capacitors. 7. Click OK to return to the schematic and left-click to place the capacitor on the schematic. Repeat for the second capacitor. 8. Next, place the 10 kΩ and 2 kΩ resistors. 9. Select OK to return to the schematic and left-click to place the resistors. 10. The resistor is horizontal, but it needs to be vertical. Select the resistor and press <Ctrl-R> to rotate the resistor 90 degrees. 11. Use On-page connectors to supply power to the operational amplifier in a tidy fashion rather than having to wire from the +15 V and -15 V rails of the virtual NI ELVIS II directly. Navigate to Place»Connectors»On-page connector. 12. Left-click to place the connector near the NI ELVIS II virtual terminal for DC power. The following dialog box appears. Select +15 for the first connector and -15 for the second connector. 13. Wire the On-board connectors to the DC power rails. 14. Place and wire On-board connectors for providing power to the operational amplifier above and below pins 4 and 11, respectively. 15. Complete the circuit by wiring the components together. The NI ELVIS II Function Generator is the input signal to the filter, and you provide a 2 kΩ load for the output to ground. Connect the NI ELVIS II Bode Analyzer to the circuit to observe the source voltage and the output voltage after being filtered. The circuit is now complete. The next section explains how to perform a Bode analysis in Multisim by simulating the NI ELVIS II hardware and observing the behavior. Note: The circuit is connected to Scope 0 and Scope 1, as well as Analog Input 0 and Analog Input 1, because the simulated NI ELVIS II device uses the oscilloscope instrument, and you connect the physical circuit to analog inputs. You can use the oscilloscope channels for the physical test, but this requires splitting a BNC cable to a Ground and Signal pair. 1. To perform a sine wave frequency sweep of the filter, you first need to enable the function generator. Double-click the NI ELVIS II Function Generator to enable the virtual instrument and launch the Soft Front Panel. 2. The NI ELVIS II Function Generator is now enabled, and you may close the Soft Front Panel window. The function generator remains enabled. 3. Next, you must enable the NI ELVIS II Bode Analyzer. In the same fashion, locate and double-click the Bode Analyzer to enable the instrument. 4. The NI ELVIS II Bode Analyzer is now enabled. Before simulating, you need to verify that all of the settings are correct. Modify the Start Frequency, Stop Frequency, and Steps (per decade) if necessary. Leave the Device as Simulate NI ELVIS II for now because you first want to simulate the device. 5. Select the Simulate button in the Multisim toolbar to simulate the frequency sweep and observe the resulting voltage, which is a Bode analysis. 6. The following image shows the resulting simulated data from the Bode analysis of an active highpass RC filter. You are now ready to build the active RC highpass filter circuit on the NI ELVIS II prototyping board to compare the circuit to simulated data. 1. The Multisim design generates the following Bill of Materials. You can find this in Multisim by navigating to Tools»Bill of Materials. 2. The next step is to properly place the components on the NI ELVIS II prototyping board. If you are new to connecting components and wires to a breadboard, use the 3D breadboard tool in Multisim by navigating to Tools»View Breadboard. This is the 3D view of the NI ELVIS II prototyping board in Multisim. With it, you can virtually lay out the circuit properly on a breadboard. This functionality is further explained in the Related Links section document NI Multisim 3D Environment. 3. After physically building the circuit, you need to ensure that your NI ELVIS II device is connected to your computer via USB and is detected by your computer. In addition, the main power and the prototyping board power should be turned on. If you experience any trouble with this, refer to the Related Links document Where to Start With NI ELVIS II Series. 4. In the Multisim environment, you can now choose to acquire data from your NI ELVIS II device. Open the NI ELVIS II Bode Analyzer in Multisim. You should still see the simulated data on the Bode analyzer. If you do not, resimulate the Bode analysis as shown in Step 2. 5. Select Dev# (NI ELVIS II) or Dev# (NI ELVIS II+), depending on which device you have connected. This is your physical device. Next, Multisim uses the physical instrumentation form of your NI ELVIS II device to generate and acquire data from the active RC highpass filter that is constructed on the prototyping board. Note: If your NI ELVIS II device does not appear in this list, save your Multisim file and then close and reopen the program. This repopulates the list of active NI devices on your system. 6. Before running the program, ensure that you select the proper Stimulus and Response channels for the Bode analysis. To begin the analysis, click the green Run button on the NI ELVISmx Bode Analyzer window. 7. You can now see the actual circuits response in comparison to the simulated response, on the same graph, and without ever having to leave the Multisim environment. The NI circuits teaching solution is an end-to-end toolchain designed to meet the needs of students and educators. It is an ideal mix of integrated hardware and software that guides students through the engineering and design process from understanding circuit theory to developing and simulating designs to prototyping and validation. The platform includes Multisim, NI ELVIS II, NI myDAQ, LabVIEW, and LabVIEW SignalExpress. Multisim provides intuitive circuit design and SPICE simulation to help students explore circuit theory and investigate behavior. It features a 3D prototyping environment that can help students move from a software environment to a lab environment. With the NI ELVIS II and NI myDAQ prototyping platforms, students can quickly and easily develop their circuits and take measurements interactively at home or in the lab using built-in virtual instruments such as an oscilloscope, a multimeter, a variable power supply, and a function generator. The LabVIEW and LabVIEW SignalExpress environments offer intuitive interfaces to measurements and help students compare their measurements and simulations on the same display.